The new lightrail line isn't only needed inside Washington County: All of the metro region needs it. Earlier this month, the long-proposed Southwest Corridor light rail project hit a snag, when a public vote on funding shifted from 2018 to 2020, and the authorizing organization changed from TriMet (the regional transportation agency) to Metro (the regional urban policy agency). Some of this change makes sense. Some seems quite baffling. But one thing is clear, the southern portion of Washington County needs a light rail line, such as the proposed Southwest Corridor linking Portland, via Barbur Boulevard or Interstate-5, to Tigard, Tualatin and possibly Bridgeport Village. An editor from the Times spoke to Tualatin Mayor Lou Ogden earlier this year and asked, "What are the three biggest issues facing your community?" "Easy," Ogden said. "Traffic, traffic and traffic." The region is growing and will continue to grow. A new study from Portland State University shows that the two fastest-growing counties in Oregon are — you guessed it — Multnomah and Washington counties. Washington County added more than 12,000 new residents in the past year, and one estimate says the county could grow by 300,000 people within just a few decades. The new light rail line isn't only needed inside Washington County: All of the metro region needs it. With more than 10 percent of the region's population, the Southwest Corridor is expected to grow by 70,000 residents and 65,000 jobs by 2035. Employment in the area already numbers more than 240,000, which exceeds the population of Eugene. About 46,000 students attend universities and colleges in this corridor including Portland Community College, Oregon Health & Science University, Portland State University, George Fox University and the National University of Natural Medicine. TriMet and Metro officials say the decision to push back the public vote, from 2018 to 2020, came about because the math just isn't ready. Initially, it had been hoped that the Legislature would include improvements in the I-5 corridor in the massive, $5.3 billion, 10-year transportation bill approved this summer. That project, combined with a new light rail, might be enough to convince voters that some real improvements in traffic and transit were in the offing. But the Legislature didn't include this project in the bill. 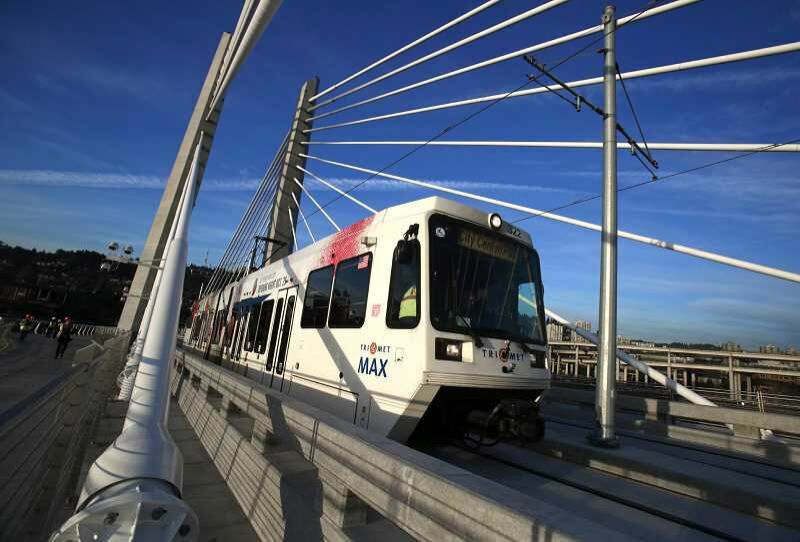 The proposed MAX line is estimated at $2.4 billion. The federal government would be asked to pony-up half the funds — that's by no means a done deal in the current political climate in Washington, D.C. But even if the federal funds came about, that would still leave $1.2 billion to be contributed by state, regional, county and local governments. To sweeten the pot for local voters, TriMet had asked elected and transportation officials within its jurisdiction to submit lists of additional local projects that could be completed within seven years. The idea is this: If people won't say "yes" to light rail alone, they might to light rail combined with local street improvements, along with bike and pedestrian improvements. Offer a little for everyone, and more people might say "yes." Will Metro, which now has the reins on this project, have the wherewithal to find enough of those other projects, and blend them into a package that can gain voter approval? That's not clear. And what exactly will voters be asked to give? A poll taken in summer 2016 by TriMet asked that question. The most popular option, at 49 percent, was a large portion from property taxes and a small portion from motor vehicle registration fees. That drops to 46 percent if a property tax was combined with tolling. A property tax increase alone was supported by only 39 percent of voters. Tualatin's Mayor Ogden and Beaverton's Mayor Denny Doyle both said they approve pushing the vote back two years, saying the whole plan just isn't fully baked yet. We reluctantly concur. But we also think a transit proposal should be organized by the transit agency, TriMet. That body has a track record for building support for light rail. Metro doesn't. Regardless of which agency is driving this train — so to speak — the need for a light rail line in the region's southwest corridor is clear. Local city and county governments will get on board if a clear, thoughtful plan is proposed, one which addresses traffic congestion. Voters will say "yes" if they see a clear benefit in their lives and their community. The sign at the platform now reads, "The next train has been delayed by two years." That's not great news, but it beats, "The next train isn't ever coming." If a delay gives the agencies time to craft the right proposal, we reluctantly concur.